Pressure is growing on David Cameron after he admitted lying to the public about his financial affairs, following yet more revelations from the Panama Papers. People are now calling for the UK Prime Minister’s head on a plate (similar to a certain pig?) after David Cameron revealed that, contrary to an earlier statement, he actually did make money from shares he had in one of his father’s ‘tax haven’ companies, reports Vox Political. Cameron himself says it was above board and that he paid tax on it all, selling his stake for around £30,000 back in 2010 before he took office. However, it seems like the Internet isn’t going to let him off that easily with #resigncameron currently top trending on Twitter, a Change.org petition and an official UK government petition now at 25,000 signatures. Infamous NSA whistleblower Edward Snowden – responsible for leaking data about government snooping – has also mocked Cameron for wanting to keep his dealings ‘private’ in the wake of the Panama Papers leak. Snowden also posted a link to information about a protest to be held outside Downing Street this Saturday. Because so many UK companies are based in Panama, the British Virgin Islands and other tropical tax haven hotspots we want to make them feel at home. Hawaiian shirts, tropical colours, sunglasses and (of course) Panama hats. If you’ve got a blow up beach ball then bring that along. 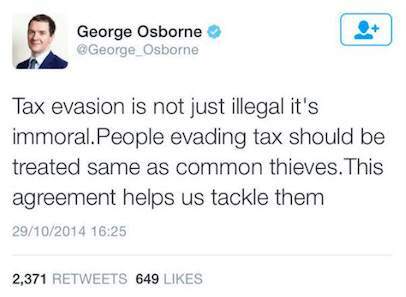 But our beloved PM isn’t the only one who thinks tax avoidance is immoral. Basically, these guys are happy to cut benefits for people on low incomes and people with disabilities and ask doctors to work longer hours for less money, while shamelessly syphoning serious amounts of money away from the UK tax system. Yes, maybe what they’ve done isn’t illegal, but it’s certainly immoral, and are these the kind of people we want making our decisions for us?